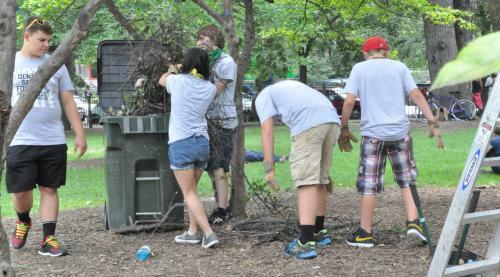 The students of Grace Community Church, a Grace Brethren congregation in Goshen, Ind., volunteered time on July 26 to help clean Wicker Park, a neighborhood park in Chicago. It was part of a day of outreach at Momentum Youth Conference and it was covered by the online news site, Our Urban Times. John Shirk, of Urban Encounter, was also quoted in the article. A portion of the story appears below. Click here to read the complete article. The Wicker Park Advisory Council (WPAC) and Wicker Park Garden Club (WPGarden) constantly work to find numerous resources to create a great park for the neighborhood and for all of Chicagoland to enjoy. In a time when the budgets of the City of Chicago, Chicago Park District (CPD), and the 1st Ward are stretched beyond their limitations, one must be very creative and resourceful to both create and then maintain excellent standards in landscaping, programming and event development. Both WPAC and WPGarden have set up partnerships with over 65 city-wide organizations as well as organizations from other cities in nearby states. All the partnerships are designed to provide assets to the park and benefits to the partner’s organization and goals. These partnerships provide a viable, expanded community where all members can create and obtain a sense of ownership and pride. This is not a community in the classic sense, but a global community that has evolved to succeed and produce great parks. On Saturday, July 26, 81 residents of Goshen, Indiana’s Grace Community Church’s Youth Group – Axis Youth Ministries came to Wicker Park to freely devote their time to work for four hours in Wicker Park. They weeded all mulched areas in the park, pruned out dead wood in shrubs and small shrub trees, dug a garden edge ditch along 300 ft. of the Park’s gardens, cleaned up trash in and around the Park, cleaned the playground, swept all the loose gravel in the dog park and put it back in the gravel pits, and swept all the sidewalks. The volunteers were recruited by WPAC’s John Shirk, head of Urban Encounter, who acts as an Ambassador to Chicago for Grace Community Church. He worked with me (WPAC and Wicker Park Garden Club) to plan the event and layout the duties that the volunteers addressed. In addition, he placed volunteers in another location on Chicago’s west side.